Choir students from nine elementary schools performed at the District 49 Music Festival on May 3. Springs Ranch Elementary School preschoolers learned the value of recycling during the program’s first ever Recycle Fair on April 28. 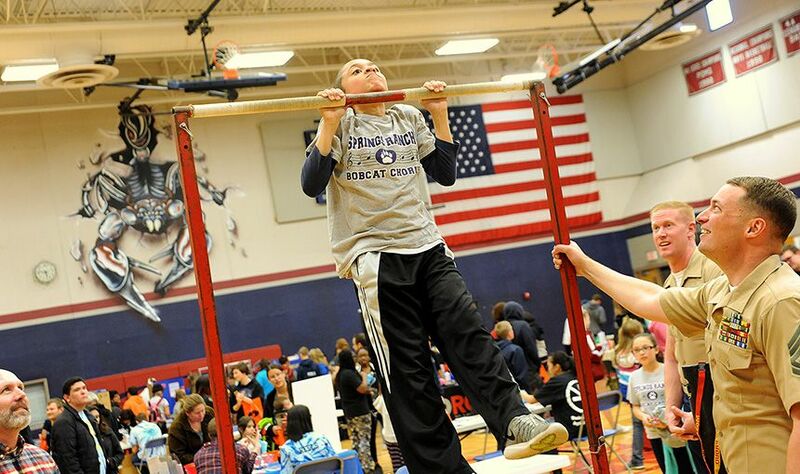 Fourth-grader Caydon Howard, 10, performs a pull-up during the Sand Creek Zone Health and Wellness Expo April 29 at Sand Creek High School. 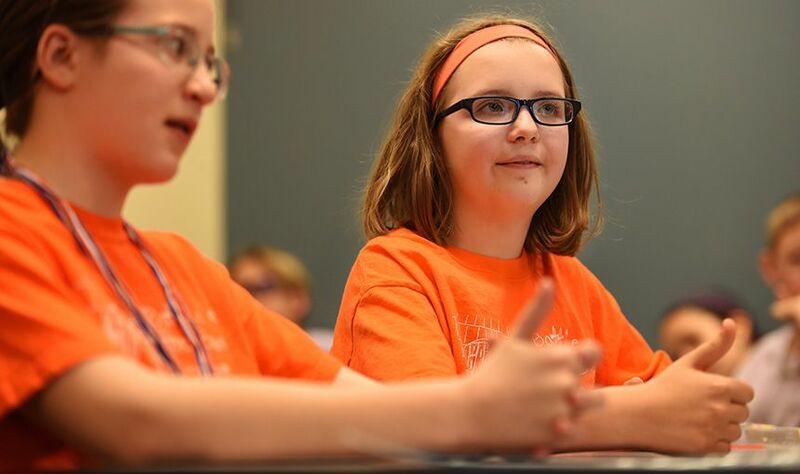 Fifth-grader Lily Lyons, 11, turns her thumb up with a team from Evans International Elementary School during a regional Battle of the Books competition April 14 at Colorado College in Colorado Springs. 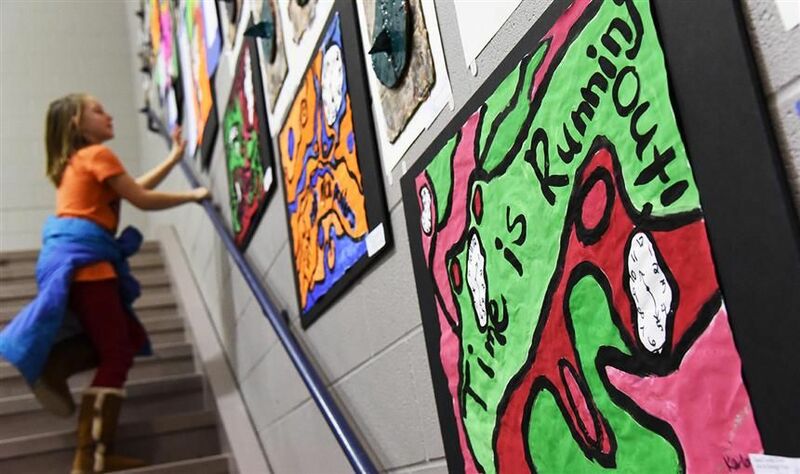 Individual educational experiences are highlighted through K-12 student art work and interactive art activities. School District 49's communication team routinely sends relational messages. Insider messages are published twice each month during the school year, explaining events in the district, as well as staff, teacher and student features. If you're not subscribed as an insider, send the form below or get started by texting "District49" to 33233. You can manage your preferences any time. The more information you provide and the more frequent you manage your email preferences, the more we'll tailor each message for you. And that's why we're an advocate for the CAN-SPAM Act. Every email provides a link for you to unsubscribe, so you can subscribe and unsubscribe whenever you like. 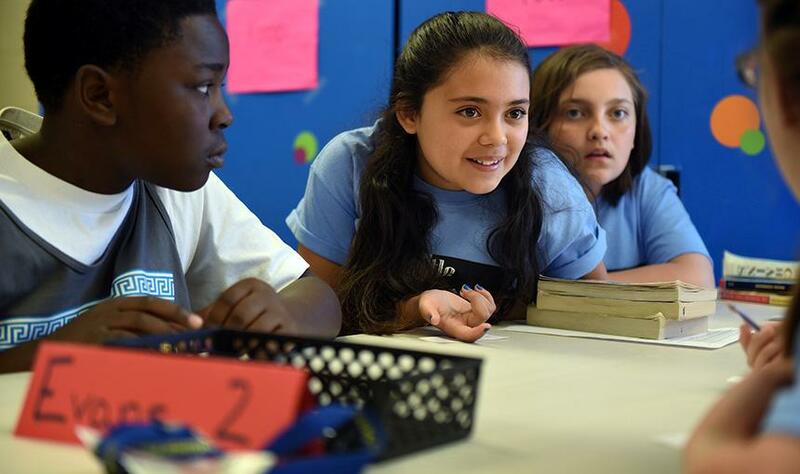 Parents who enroll a student in District 49 schools are often proactively subscribed to our insider emails, but will never be resubscribed after choosing to unsubscribe -- say that 10 times fast! When you sign up for District 49 FlashAlerts, you are one of the first to know when the district calls a delay or closure. This system, separate from our other electronic messaging systems, is only used to expedite emergency messages via email and text. 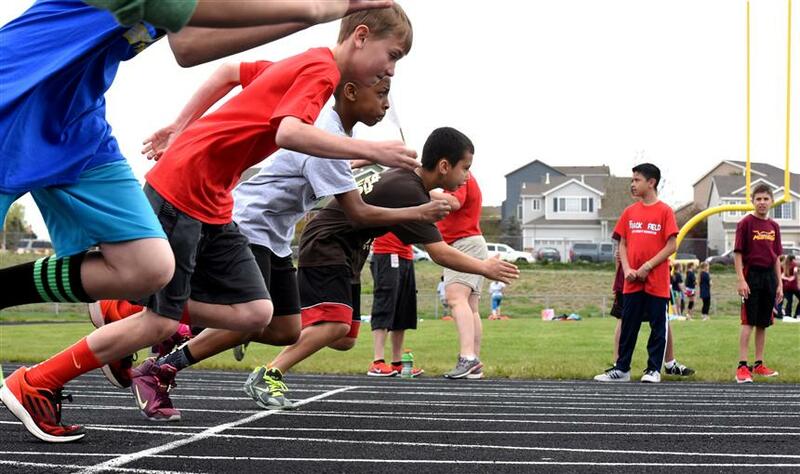 "It's a great chance for our kids to be out and compete against other schools," said Kara Woolery, Evans International Elementary School counselor, "They are showing us what they can do and are such upstanding young people. It's a nice way to end the year." The Stetson Raider Choir, led by Becca Garner, performs 'Pizza Love' April 27. 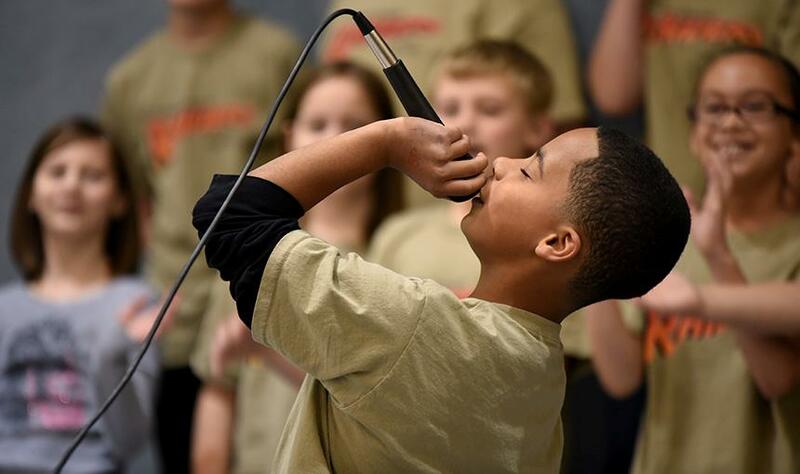 Fifth-grader Shawn Escobar grabs the microphone at the end of the song an outro solo. Students attending the event went wild for Escobar. Before the performance, Escobar wanted to give the part to someone else, but encouragement from Ms. Garner was successful. 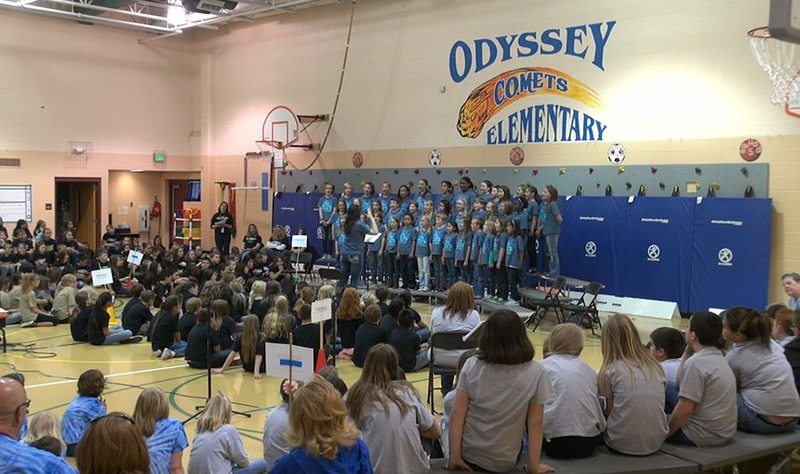 The Elementary Choir Festival, an annual tradition in District 49, was held at Woodmen Hills Elementary. 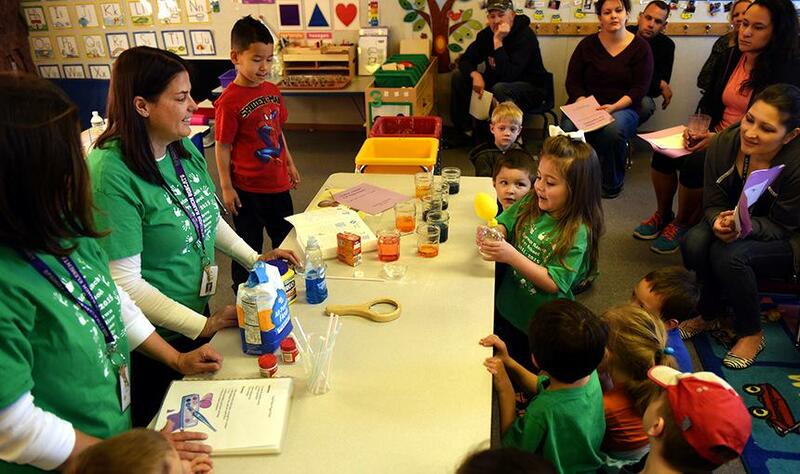 Teacher Anne Flemke watches preschooler Ava Pairsh, 5, inflate a balloon by creating carbon dioxide with baking soda and lemon juice during a family science workshop April 24 at Springs Ranch Elementary School in District 49. 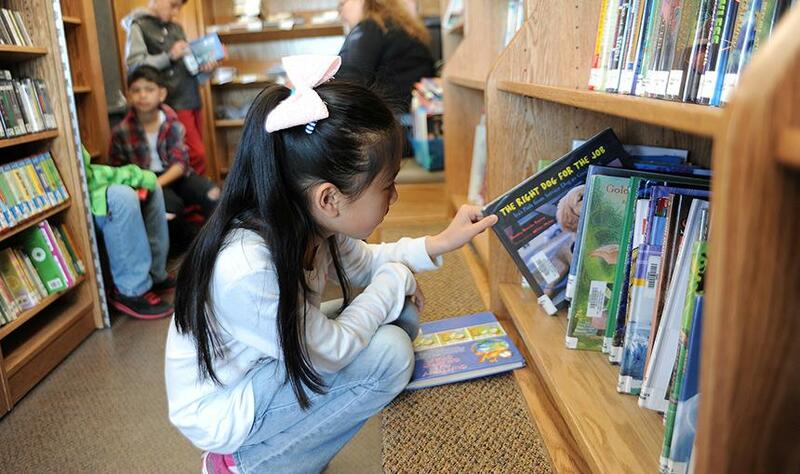 Fourth-grader Guo Jing Tang, 9, looks for a book in the Pikes Peak Library District bookmobile outside of Springs Ranch Elementary School April 9. 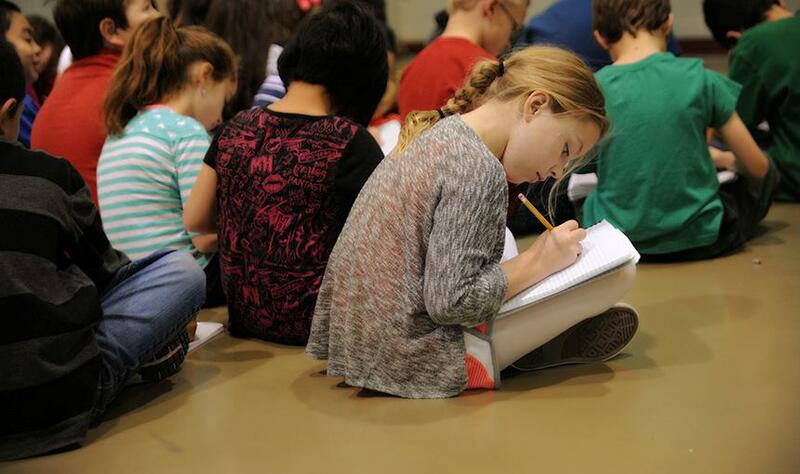 Third-grader Taylor Davis, 8, writes ideas in her writer’s notebook during an author visit Jan. 28 at Springs Ranch Elementary School in District 49. 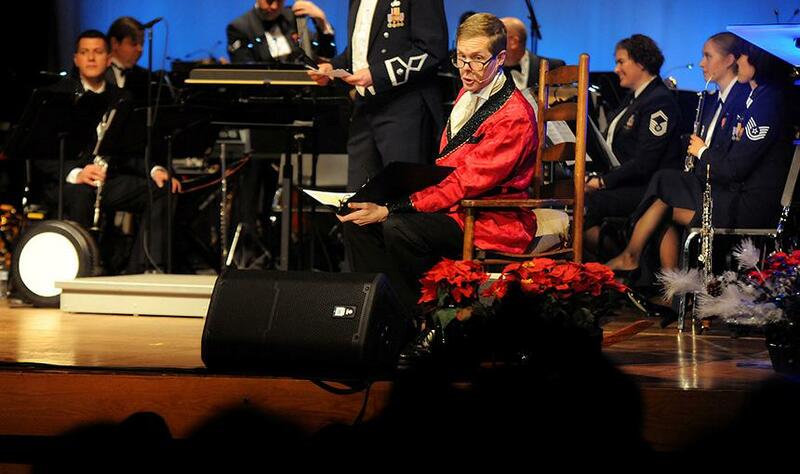 George Preston, KCME-FM general manager, reads “’Twas the Night Before Christmas” during a special U.S. Air Force Academy Band "Holly and Ivy" concert for elementary school students Dec. 17 at Sand Creek High School in Colorado Springs. 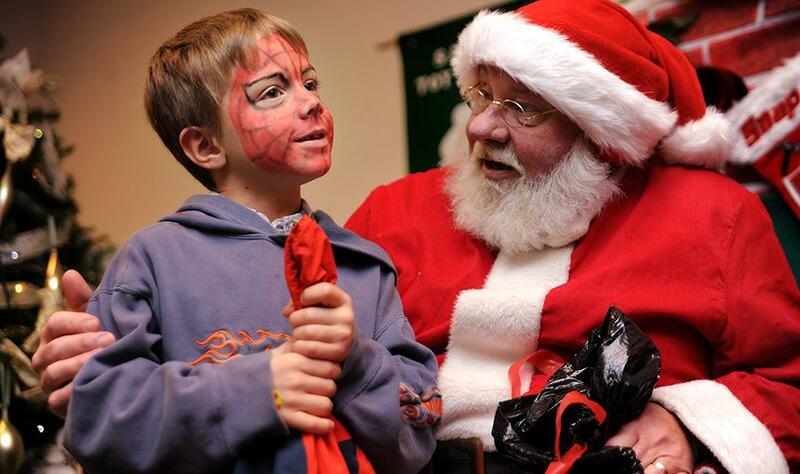 A child speaks with Santa Claus, played by retired firefighter Jim DeGeorge, after shopping for his family Dec. 6 during Santa’s Toy Express at the transportation department in District 49. Fifty-one students, most 4-8 years old, received a call this year from the “elves” of Santa’s Toy Express. 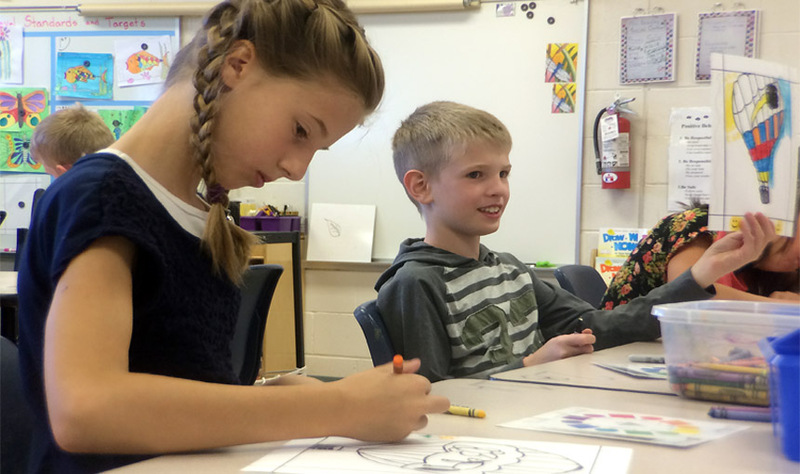 Fourth-grader Nathan Asp, 9, shares his artwork with a classmate Sept. 18 during National Arts in Education Week at Springs Ranch Elementary School in District 49. 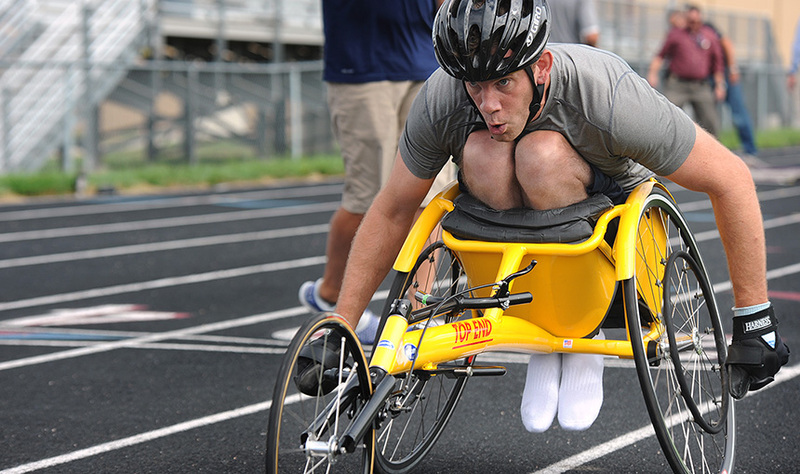 While faculty members prepared for a new school year July 29 at Sand Creek High School in Colorado Springs, Jess Markt was racing on the outdoor track. 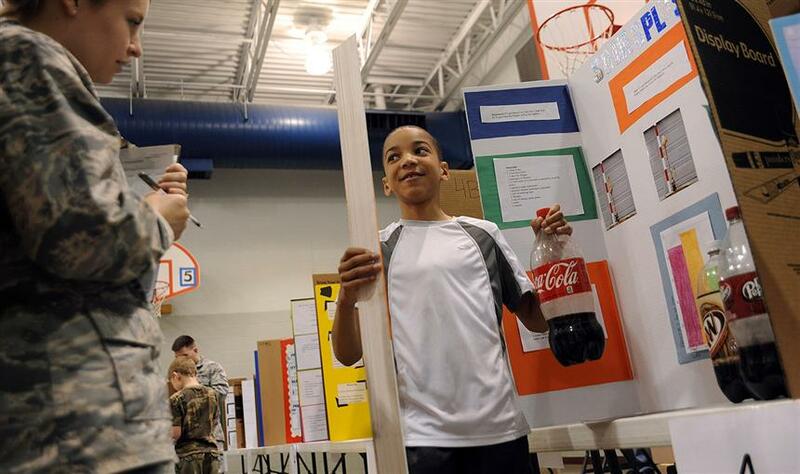 Fourth-grader DeAndre Davis, 10, explains his "sodaspolosion" project to Air Force 2nd Lt. Jane Blore of 1st Space Operations Squadron, 50th Space Wing, during an annual science fair April 18 at Springs Ranch Elementary School in Falcon School District 49.